Building our empire one hard roll at a time! Do you remember that corner Italian bakery that you used to go to back in Rhode Island? Can you still smell the aroma of freshly baked bread? 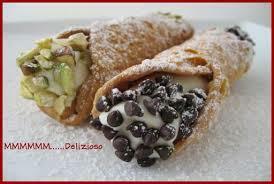 Does your mouth still water at the anticipation of a creamy cannoli? Are you searching for authentic pignoli cookies? Do you need calzones, pizzas, party platters and cookie trays for that special party? Paisano's Italian Bakery is your answer. We are a full line bakery offering Italian pastries and cookies. In addition, we offer hamentashen, kolachky, coffee cakes, scrumptious brownies, and many other items. Pizzas, calzones, lasagna, stuffed shells, eggplant, meatballs, and soups are a perfect meal for discriminating customers who want a quality lunch or dinner. Paisano's will prepare custom orders for all occasions. Our cookie and pastry trays are elegant, and our custom cakes are fun and whimsical. All of our products can be personalized for that special touch. Wedding cakes are customized by our expert designers. You can pick a design from our catalog or sit down with the designer to plan out your own memorable cake. Delivery and setup are available.